The EH&S Laboratory Safety program helps researchers, lab managers, and supporting lab staff establish a safe work environment and maintain compliance with all local, state and federal regulations. 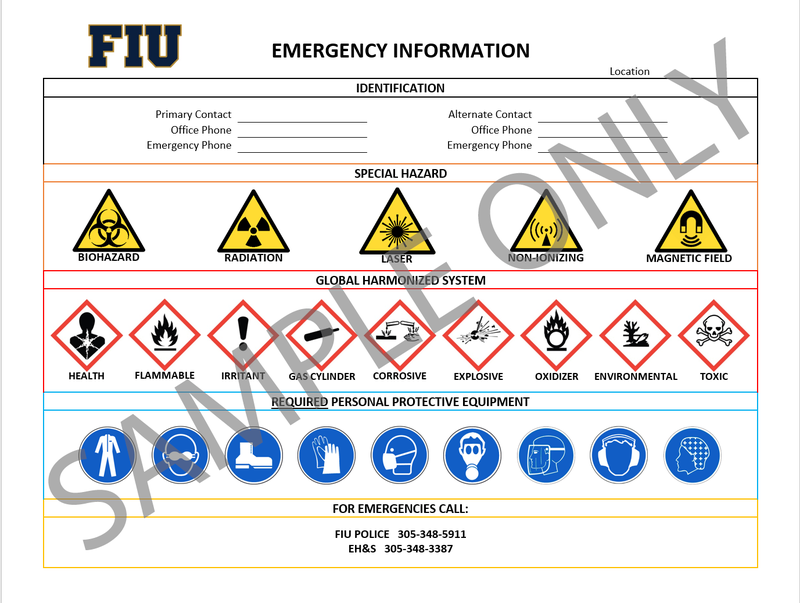 The EH&S Emergency Signage Program is a mandatory initiative that ensures FIU is compliant with the GHS, NFPA, and Hazard Communication regulatory requirements. The signage displays a primary and alternate contact for the space, special hazard pictograms, GHS pictograms, PPE pictograms, and important emergency numbers. Please follow this link to access the online Qualtrics survey. Once you have completed the survey, please email Tamece Knowles (knowles@fiu.edu) or Victoria Leyland (vleyland@fiu.edu) and EH&S will generate the signage and deliver it to your area. NOTE: One sign per lab space. You cannot combine two (or more) lab spaces into one sign. All new signage must be posted on each entry doorway to the lab space (Do not post on walls). EH&S will provide a page protector for posting, if needed. For shared open lab spaces, the signage must be placed on the main doors. This signage replaces all "old/outdated" EH&S signage previously installed. ​Using an easy-to-follow checklist, principal investigators, lab managers and staff can spot potential safety and compliance concerns. The checklist will be reviewed by EH&S to verify whether safety equipment, standards, and practices are in place as required by the Occupational Safety and Health Administration (OSHA), other applicable regulatory agencies, and institutional policies. The LSA will be used in conjunction with the EH&S annual inspections to identify compliance concerns/deficiencies and allows EH&S to assist in implementing corrective actions by educating the lab users on best laboratory practices and procedures. Please read the latest communication pertaining to the upcoming launch of the 2018 LSA. LSA Preview – Check out the questions and perform a walkthrough in preparation for your audit. Please note: This is NOT the official Lab Self-Audit. Please do not submit to EH&S for review. Lab Self-Audit – LSA is currently closed - Ready for your audit? Complete it within the scheduled time frame mentioned in the latest communication (above). If you need assistance, please contact the lab safety staff. LSA Feedback – Have ideas for improving the LSA? Let us know. Need to know what training is required for your type of lab? Check out the laboratory training matrix and stay compliant! If you have any questions, please contact EH&S at 305-348-3387 or ehs@fiu.edu.